Negev flower season brings thousands; farmers report many stole and destroyed crops, drove through wheat fields, broke into greenhouses. Ynet reports that visitors at an annual flower festival in southern Israel this weekend stole oranges, tangerines, and lemons from private orchards, trampled produce growing in the fields, and left mounds of garbage. 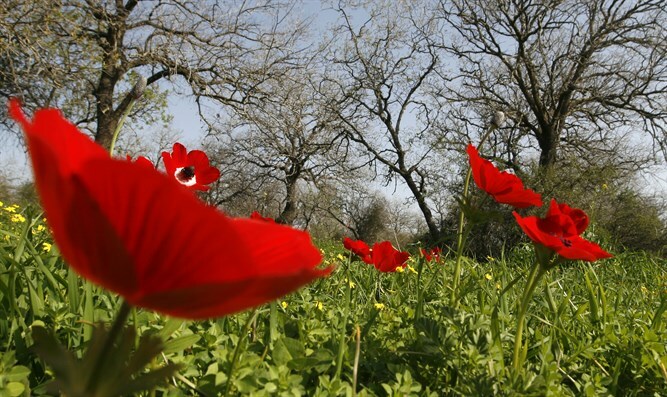 Authorities say more than 60,000 people visited the area to kickoff the Darom Adom (Red South) festival, marking the annual red anemone blossom in the northern Negev. Besides stealing produce, farmers told Ynet that visitors held picnics in the wheat fields near Kibbutz Be'eri, where some drove over crops with their vehicles. A farmer from Moshav Shuva in the Sdot Negev Regional Council said, "I don't recall my orchards turning into a free market. The visitors emptied my groves, while having their picnics and leaving behind huge amounts of trash. I couldn't believe my eyes when I came to work this morning. After tearing through the greenhouse nets, the visitors went inside and stole vegetables," the farmer said. Police said they would increase presence near agricultural areas to combat thieves and visitors damaging produce.